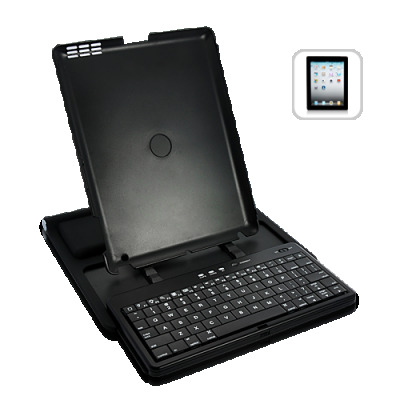 Successfully Added 360 Degree Adjustable Bluetooth Slider Keyboard Case for iPad 2 to your Shopping Cart. 360 Degree Adjustable Bluetooth Slider Keyboard Case for iPad 2- a revolutionary approach to truly taking your iPad2 anywhere! Yet for a long time, the number one customer complaint regarding these Bluetooth wireless keyboard cases is the inconvenience of having to adjust the keyboard case for iPad 2. Now, no more waiting! We listened to your feedback and designed this amazing case which exceeds your every need to deliver a truly brilliant typing and viewing experience on your iPad 2! The 360 degree rotating stand/case for iPad2 provides full access to all buttons and slots, so it is fully operational without ever having to leave the case. In addition, it provides an attractive and functional way to carry and use the iPad2, giving you great flexibility for controlling the device! With the slider keyboard and 360 degree adjustable stand, you can type in any position you want. Horizontal, vertical, laying on the bed, sitting at your desk - the ultimate convenience for your iPad 2 is here! The cool and stylish look makes sure that your iPad 2 still looks just as shiny as before, while offering a soft-touch finish for a secure and comfortable grip as well as excellent protection in case of bumps. Even better, this case comes with a QWERTY keyboard made from polycarbonate composite to offer you better tactile key response and maximum typing comfort. Every stroke you make is comfortable, fluid, and whisper-quiet with this amazing key design. If you are looking for a gift to give the iPad 2 owner in your family or circle of friends, here it is. If you are reseller, it’s time to shake hands with technology and buy through our web store-Chinavasion, the one shop for quality electronics. Available in our warehouse now, add it to cart now and we'll express ship it out tomorrow! Hidden compartment for the connection cable - no more dangling lines! Does this iPad 2 case work with other devices supporting Bluetooth? This product is very good, great finish and convenient to use, very worthwhile!